Before the coming of the Catholic conquistadors, natives lived with death as a constant companion. The Chichimecas believed the spirits of the dead remained among the living to be acknowledged through song, dance, and food. The cult of ancestor worship was deeply rooted in Mesoamerica. 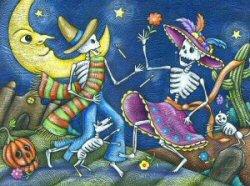 Consequently, the morphing of All Saints’ Day, All Souls’ Day and Day of the Dead into preexisting practices was an easier one. It was customary for the indigenous to celebrate children who died during pregnancy. For example, the Aztecs referred to October 31st as the day for unborn children. When the Spanish arrived, November first became All Saints’ Day. On this day every saint is honored (Halloween costumes were originally base solely on saints.). In addition to saints, the souls of dead children, those considered to have lived pure and innocent lives, are celebrated. The indigenous made figures from corn leaves or wood from poplar and other trees found near where the Allende dam is today. These toys were place with atole (a corn and chocolate drink) on altars designed to entice the children’s return. Today listen for church bells and firecrackers going off throughout the night to lure the little ones home. In addition, handmade toys and other items children like are displayed. The toys and other offerings are left behind because the point is not for the lost souls to take items with them but to leave them behind offering their families pleasant memories. 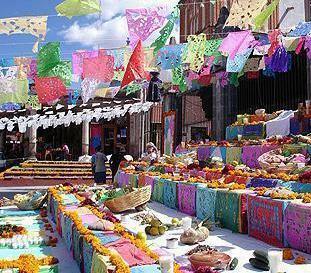 November second is All Souls’ Day, or Dia de los Muertos (Day of the Dead) celebrating the faithfully departed. Memorial altars for dead adults are found in cemeteries, on public display and in private homes. The altars are an odd mixture of pagan and Catholic beliefs designed to welcome the dead back momentarily. 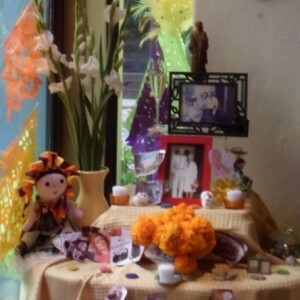 Normally altars have seven levels for the seven points of transformation during death. An image of the saint, or virgin, that helped the deceased reach God. Left blank for the lost souls of purgatory. Salt serves to purify the body from corruption while also orienting the spirit for the trip again next year. Bread of the dead in the shape of a body (or bones) is the body of Christ with red sugar for Christ’s blood. The favorite meal and fruit of the deceased. A photographic tribute of the deceased. Some don’t put a photo, but a mirror to remind the deceased they no longer have a body and cannot return to it. A cross redeems the soul from guilt and is a reminder of God’s constant guidance. Meanwhile candles and marigolds sit alongside simmering herbs of basil, rosemary, chamomile and laurel. A paper chair of purple and orange signifies life and death plus the mixing of the Church’s royal purple with the indigenous orange. The bright paper flags signify thanks for the happiness of life while reminding us of the paper thin line between life and death. The flags also serve as a curtain to keep out other, less savory, spirits that may be out and about this night. The chopped white paper signifies the pure soul that enters heaven. The white paper also admits the angels that guide the souls of children and protects them on their journey to and from their altar. White flowers represent the souls coming from heaven. The marigold’s many petals represent their days on earth. Purple flowers are for mourning. The flowers adorn and provide fragrances to guide the spirit home. Lit candles represent faith that the soul’s ascent into heaven to enjoy eternal life while also providing directions to the altar. The incense smoke indicates the passing of life for the departed and to guide them back to heaven. Incense also rids the altar of any bad spirits while cleansing the spirit of the deceased from their long trip. Corn represents the harvest of good actions in life and a good death. Fruit implies the importance of natural world. Oranges, in particular, are the sweetness of life and gratitude to be rid of all life’s infirmities. The sugar skulls represent the deceased often with their name spelled across the forehead. Skulls often reside in threes to represent the Holy Trinity with God being the biggest skull. Lastly sayings, or poems, are featured about the deceased’s friendship, work, politics, etc. Today, private altars are normally at home. At home, the indigenous place honey, pumpkin seeds and marigolds with 365 petals representing every day in a year in memory of the good actions and happiness of this life. 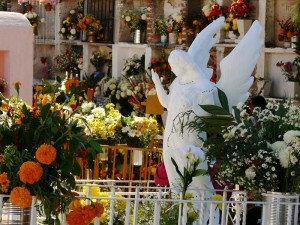 Outside the home, it is customary to place altars at cemeteries on the deceased’s grave. Sometimes as altar only three levels are used that represent the underworld, earth and heaven. To construct an altar for a loved one is both a moving and cathartic experience that can bring much joy to the living. Pictured is one I did for my parents. Europeans brought the traditions of flowers and candles while the indigenous brought incense, food, marigolds plus the concept of acceptance that life today is just a phase for life eternal. The custom of the indigenous was to pass the night in the chapel sitting on the floor singing. A bonfire outside the church lit the way for the lost souls to recognize where they are expected. Also crosses with four candles at the four points were placed on the ground with only one candle lit. The lit candle indicated what direction the spirit was to travel in. Eventually the spirit would enter the church and enjoy the offerings especially for them including pots and vases of water as people believe the lost souls are tired and thirsty. 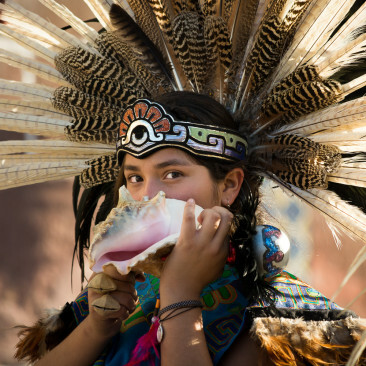 The indigenous danced and sang around the bonfire blowing sounds with large conch shells and small flutes. In Colonial times on November 2nd it was custom to have mass said on an altar with black cloth, black candles and a black cross. Both clergy and the general public wore black this day. The wealthier Spanish wore black for the entire month. On the night of November 3rd the ingenious had a mass to give thanks to God for permitting the lost souls to visit their families here on earth and ask to receive them again the following year. This mass features an image of San Miguel alone with a tiny cross as Saint Michael doesn’t have family and is alone. This same cross is found in home altars signifying Jesus triumph over death. 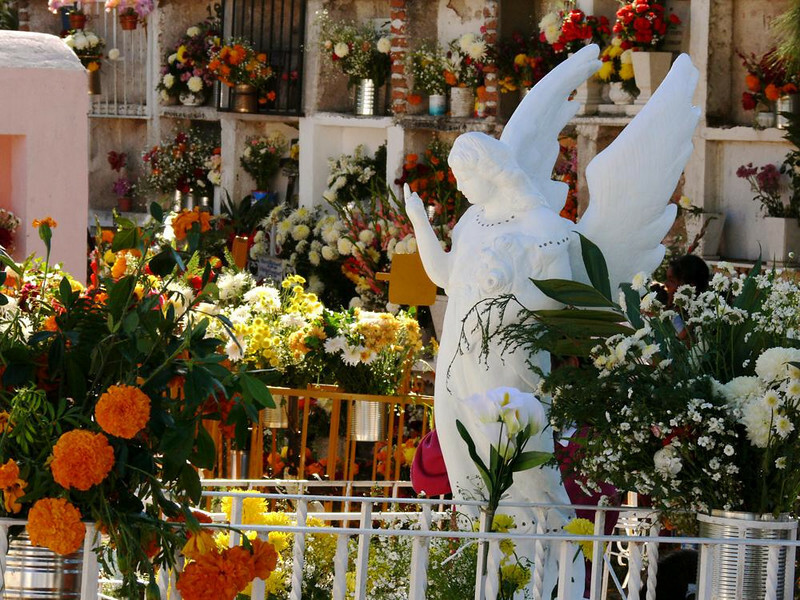 Originally the indigenous cemetery was in front of where the Parroquia is today. Father Bernardo de Cossin leveled the cemetery in 1552 in front of where the Parroquia was to be built to convert the indigenous as they did not believe in worshipping inside. Later the Hospital of San Rafael (patron saint of the sick, nurses and doctors) was build to care for those in San Miguel (later renamed the Hospital of San Juan de Dios and no longer existing). Beside it was built a cemetery for the Spanish that still stands behind the San Juan de Dios church. Next to it was a cemetery for the indigenous where the DIF (social services for families) building is today. In the indigenous cemetery was a huge cross Father Jose Guadalupe Mojica had moved to the Mexiquito orphanage he created when the DIF building was constructed. Catrinas (well dressed skeletons) frequently appear this time year in parades and festivals. Originally Catrinas were used in political cartoons in the early 1900s by Jose Guadalupe Posada spoofing the wealthy Spanish as we all look the same once dead and in skeleton form. Today they are an icon for Dia de Muerto. Skeletons and skulls have a long history in indigenous worship. The Aztecs believed in a Queen of the Underworld, Mictecacihuatl, who kept bones in the underworld and presided over festivals honoring the dead that later folded into All Souls and All Saints days. The tribes of Toltecas, Otomies, Zapotecos, Mayas, etc. all had cult to the dead with similar rituals. Each had no fear of the dead and venerated them. Natives were normally buried with instruments associated with their work, food, drink and flowers. In Mesoamerican culture the soul would find its path according to the death that person had. Those that drowned would go to the paradise of the Rain God. Women who died during childbirth and warriors who died in battle would to go the temple of the Sun God. Others had to cross mountains, winds full of knives and the dangerous river Chiconauhuapan to enter heaven. To help the soul’s journey a hairless dog named Izcuintle (Nahuatl for dog) would be sacrificed so the faithful dog could aid the soul. Often sugar dogs are placed on altars today representing their assistance. Frequently you will see a butterfly on or near a skeleton. The monarchs, that arrive here each October, were believed to transport the souls of departing returning to visit family and friends.